You are looking at a set of BRAND NEW, ORIGINAL Japanese Drama box set. Japanese Languages with Traditional/Simplified Chinese/English Selectable Subtitles. * Traditional/Simplified Chinese/English Subtitle can be switched off. It is off by default unless you turn it on. 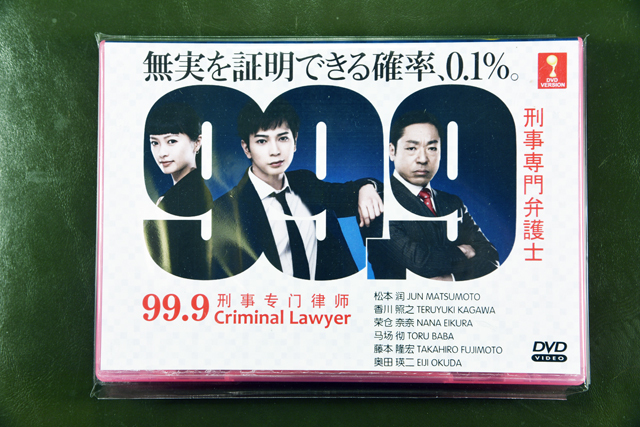 BRIEF SUMMARY: The conviction rate for criminal cases in Japan is 99.9%. However, this hides a big danger. Once indicted, there is a tendency to accept the prosecution’s story at face value. There are also extremely few lawyers that specialize in criminal cases. Therefore, a thorough verification is very difficult. Miyama Hiroto (Matsumoto Jun) is a young, unconventional lawyer who constantly accepts criminal cases which are not lucrative. He fixates on the remaining 0.1% and pursues the truth until he is satisfied. One day, Miyama is headhunted by Madarame Haruhiko (Kishibe Ittoku) who heads one of Japan’s four largest legal firms for his track record of pulling off exonerations many times over. He is transferred to the criminal cases team which has been set up in the name of corporate social responsibility, but the person who is supposed to be his buddy is Sada Atsuhiro (Kagawa Teruyuki), an ace in civil cases. Sada serves as legal counsel to a big company and makes big money for the law firm. However, he is tasked with leading the team and has to suffer the indignity of taking charge of unprofitable criminal cases.